When choosing an infant formula, many parents select one made from cow's milk. In fact, 80 percent of infant formulas are made with cow's milk. However, some babies have difficulty digesting this type of formula due to milk allergy, lactose intolerance—which is actually rare in babies—or an even rarer condition called galactosemia. Lactose-free formula is typically made from cow's milk that has been refined to remove the lactose and replace it with a different carbohydrate. Many people misunderstand the differences between lactose-free formula, cow's milk-based formula, and soy formula. While neither lactose-free formula nor soy formula contains lactose, some lactose-free formula is created from cow's milk and contains cow's milk protein. These formulas do not work for babies who are truly allergic to cow's milk. In order to digest lactose, the body needs to produce an enzyme called lactase, and some babies do not produce enough. Often, this is temporary, such as after a bout of diarrhea, which damages the digestive enzymes in the intestines. However, this usually doesn't require a switch to lactose-free formula. Other babies may lack the ability to produce enough lactase in the long term, resulting in symptoms of lactose intolerance such as gas, bloating, diarrhea, and colic. These babies may benefit from a lactose-free formula. Cow's milk is one of the top allergens for children. However, this allergy is typically to the protein in milk, and not the lactose, which is a sugar. A milk-protein allergy may be present at birth or may develop as a child ages. Symptoms of a milk-protein allergy include hives, runny nose, diarrhea, vomiting, and irritability. It may be confused with colic, gas, or other common baby issues. More serious reactions may include swelling of the lips, tongue, and throat, and anaphylaxis. If your baby is having a severe reaction to a potential allergen, call 9-1-1. Babies with a milk-protein allergy should not drink lactose-free formula. What's more, many babies with true cow's milk protein allergies can also be allergic to soy and require a specialized formula. Does My Baby Need Lactose-Free Formula? Few babies truly need a lactose-free formula, and at least one study has shown that these formulas don't reduce babies' fussiness. Lactose intolerance is much more common in children age 2 and up. Some babies do have a rare, inherited medical condition called galactosemia. These babies have an intolerance to galactose, one of the two sugars that make up lactose. This condition is diagnosed at birth, via the standard battery of newborn screening tests, or prenatally. Babies with galactosemia cannot tolerate breastmilk and must have a lactose-free formula that is not derived from cow's milk. Most major formula manufacturers now make very specialized formulas for babies with all different types of allergies. Talk to your baby's healthcare provider to find a formula that is best suited to your baby's needs. 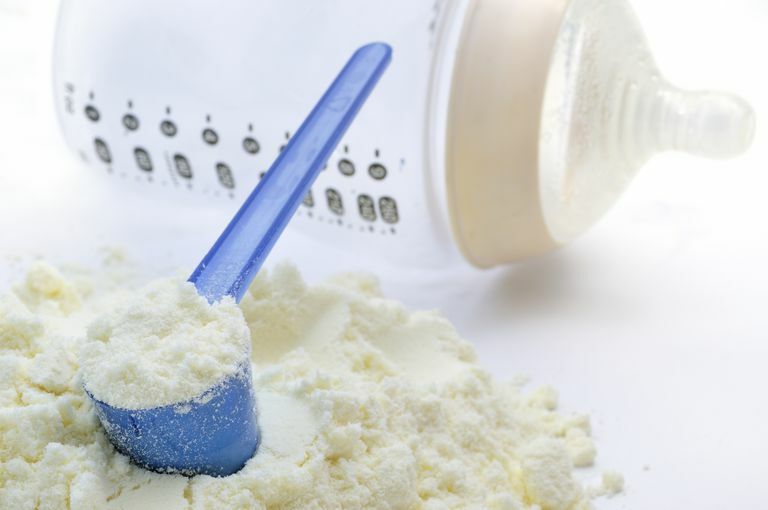 American Academy of Pediatrics: Choosing an Infant Formula, July 24, 2018. Sherman AL, Anderson J, Rudolph CD, Walker LS. Lactose-Free Milk or Soy-Based Formulas Do Not Improve Caregivers' Distress or Perceptions of Difficult Infant Behavior. J Pediatr Gastroenterol Nutr. 2015;61(1):119-24. Can You Drink Cow's Milk If Your Breastfed Baby Is Allergic?